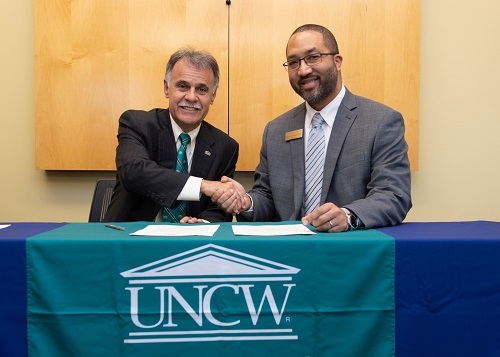 UNC Wilmington Chancellor Dr. Jose Sartarelli (left) and Edgecombe Community College President Dr. Greg McLeod recently signed an agreement that enables ECC students to be guaranteed admission into UNCW once they complete their ECC degree. Edgecombe Community College and the University of North Carolina Wilmington have signed a partnership agreement that guarantees admission to UNCW for qualified ECC students. The Pathway to Excellence Program assures admission to UNCW for students who complete an Associate in Arts or Associate in Science degree at Edgecombe Community College. UNCW will provide a transfer student success advisor who will meet with students on the ECC campus at intervals throughout each semester, working in collaboration with ECC advising staff to help students design a transfer path. UNCW also will host ECC students annually at an open house event. In addition, UNCW will provide an application event each spring on the ECC campus providing application fee waivers to students applying to transfer. Dr. Greg McLeod, president of Edgecombe Community College, and Dr. Jose Sartarelli, chancellor of the University of North Carolina Wilmington, recently signed the agreement. “The Pathway to Excellence Program ensures that our students have access to the resources and support they need to successfully complete their associate degree at ECC as well as their four-year degree at UNCW,” says Dr. McLeod. According to the UNCW website, UNCW has partnered with 15 NC community colleges on the Pathways to Excellence program.